The Pittsburgh Penguins won a big two points with a 3-2 win over the Columbus Blue Jackets, but they've potentially suffered a big loss as Evgeni Malkin exited the game early with what appeared to be a wrist injury. The star center had 2 assists before leaving the game, and Marc-Andre Fleury became the 4th fastest goalie in NHL history to win his 350th career game in what devolved into a series of questionable hits by the Blue Jackets in the 3rd period. Kris Letang, Chris Kunitz, and Carl Hagelin scored the goals for the Pens, and Pittsburgh moved back into the 1st wild card spot in the Eastern Conference and are momentarily 4 points behind the Islanders in the Metropolitan Division with 2 games still to play against the Isles. It was a slow start to the game for Pittsburgh as the Blue Jackets had the early advantage in possession. The Pens had an opportunity minutes into the game when Sergei Bobrovsky shot the puck over the glass to take a delay of game minor, but Columbus was able to kill it off, even with multiple Blue Jackets losing their stick during the penalty kill, including the goalie. The Penguins would have a great chance 5 minutes into the game when Bobrovsky couldn't control the rebound. The puck was lying loose in the crease, but Tom Kuhnhackl wasn't able to put the rebound into the empty net even as the lights came on behind the play. The Blue Jackets immediately took it back the other way, and Gregory Campbell took the pass on the rush and shot it past Marc-Andre Fleury to give Columbus the early 1-0 lead. Shortly after the Blue Jackets nearly extended their lead as Cam Atkinson picked off a pass in the slot and rang a shot off the crossbar. Things changed in the first period when Rene Bourque hit Bryan Rust up high on an interference near the boards. He got 2 minutes for interference while Jared Boll and Nick Bonino got offsetting minors for roughing. The Pens would make Columbus pay when Evgeni Malkin fed Kris Letang up high in the zone, and Letang one timed the puck past Bobrovsky to tie the game 1-1. The Pens threatened to give the lead back to Columbus after Olli Maatta was sent of for interference, but Pittsburgh was able to kill off the penalty. The would go into the first intermission still tied 1-1, but it had the feeling of a game just waiting to burst wide open, and the 2nd period didn't disappoint. And it was less than a minute into the period before the Pens pulled ahead 2-1. The Blue Jackets turned the puck over in their own zone, and Crosby shot the puck wide from between the circles. Patric Hornqvist shot the puck at Bobrovsky from below the goal line, and Chris Kunitz was able to put the rebound home to give Pittsburgh the lead. The Pens got some potentially bad news when Malkin took an awkward hit from Dalton Prout behind the net, and he immediately went down the runway when he got off the ice. He would momentarily return to the game, but it wouldn't last for long before he headed back to the locker room. The Pittsburgh lead also didn't last for long as the Blue Jackets answered shortly after the Penguins' goal to tie the game. Ryan Murray threaded a pass past Maatta to spring Atkinson on a breakaway, and Atkinson was able to deke around Fleury and shoot the puck in on his forehand to make it 2-2. But the Pens would be next to quickly answer, and after a Malkin shot on goal Phil Kessel managed to get his stick on a rebound and slide the puck over to Carl Hagelin. Hagelin was able to bring the puck onto his backhand and put it past Bobrovsky to pull Pittsburgh back into the lead 3-2. And as if the pace wasn't quick enough, Atkinson nearly had his second breakaway goal not long after, but Fleury was able to pokecheck the puck away to neutralize the scoring chance. The second half of the 2nd period would begin to settle in and calm down from the hectic first 10 minutes, but the Blue Jackets did have a chance late to tie the game when Sidney Crosby was sent off for playing the puck with his hand off a defensive zone face off. The Penguins would kill off the Columbus opportunity, then they got their own when Bourque took another interference penalty against Crosby. The Pens went into the intermission with 35 seconds still left on the power play, but they weren't able to score on the rest of the man advantage after played resumed in the 3rd. Despite the close score, the Pens continued to solidify their grasp in the possession game, and play routinely found itself down in the Columbus defensive zone. Neither team managed to get much in the way of a prime scoring chance through the first half of the period, and not surprisingly the Blue Jackets resulted to questionable play. With Brian Dumoulin in an awkward position, David Savard gave him a hard shove into the boards that knocked the Pens defenseman out of the game. Moments later Scott Wilson was given a hard hit into the boards without touching the puck. Bryan Rust also found himself mugged taking the puck to the net on a Pittsburgh rush, but the refs inexplicably put their whistles away in the 3rd period and let the game get away from them. When they finally decided to call a penalty, they somehow sent off Kuhnhackl for a phantom offsetting minor along with Scott Hartnell. But even with the borderline plays, the Penguins were able to keep their one goal lead, and they held on through the end to secure the victory. 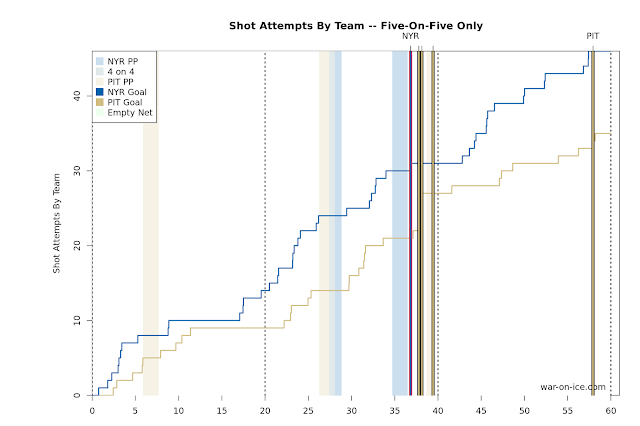 As usual, the Penguins dominated the possession game, and they posted an absolutely astounding score-adjusted 64.0 CF%. And unlike some games recently, the Penguins got the result they deserved, although the final score was closer than they would have liked. With the win, the Penguins pull 2 points closer to the teams they're chasing in the division, and they'll have an opportunity for a huge 4 point swing when the take on the New York Rangers Sunday in New York.